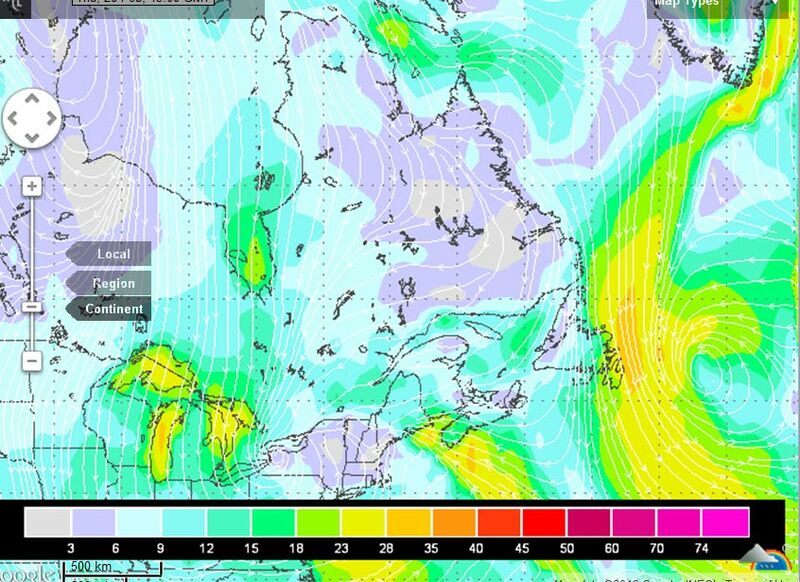 Newfoundland is getting their own blast of fun as well from this... N/NE winds blowing for days due to a nice low pressure system offshore... TWO Ivory Gulls already... I'm excited, and I can't even be there.. There's a chance of snow flurries in Florida (central) in the forecast due to this! Had another group of Bohemian Waxwings today on my drive to work. This time at Hwy 6 and York Road - right in the heart of the HSA! Haven't seen them then far south very often.. (my southernmost is Port Stanley with Kentucky a few years ago in the winter).. 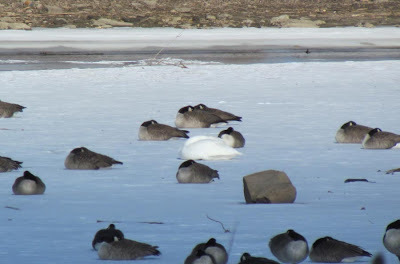 The beauty of spring migration is that birds are all crazy trying to get back to the breeding grounds quickly, so I'm sure things will continue to progress.. Heck, Tundra Swans fly regardless of any external factors that are in place. 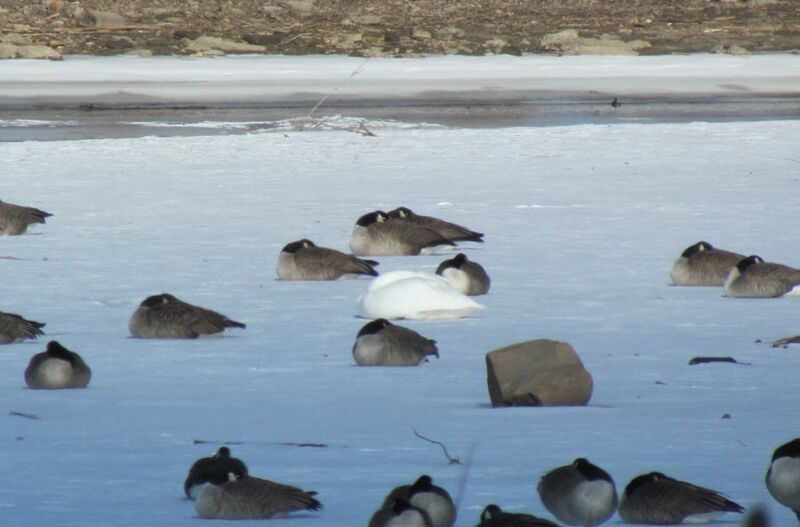 Tundra Swan don't care. 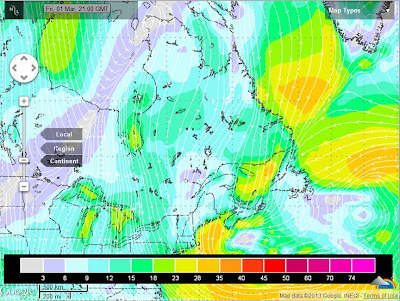 Winds forecast for Feb 28th around Mid day.... 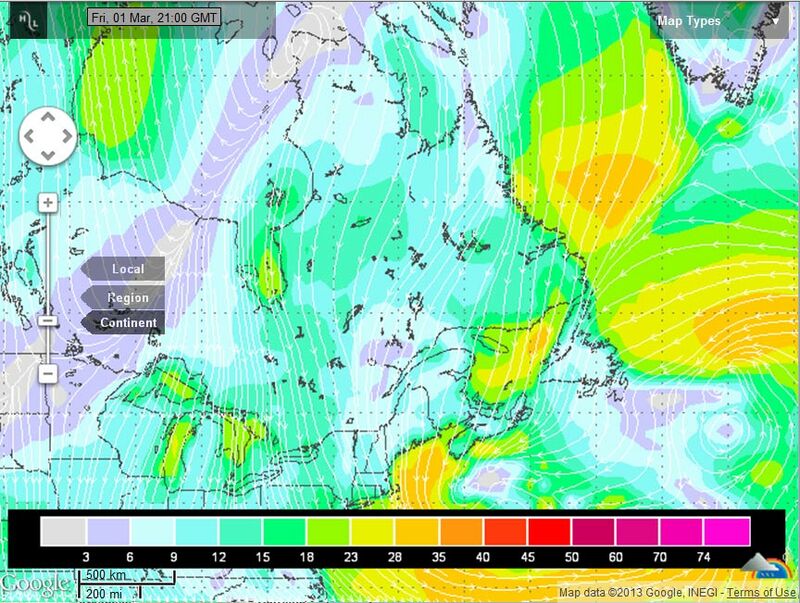 The low is drawing air from norther hudson bay! Again - I'd file this one in the 6/10 excitement factor.. I will probably keep a closer eye on the lake from my Condo for a few days, and keep an eye on ontbirds, but I'm not excactly going into red alert.. Hopefully we'll be pleasantly surprised though with something epic! But I can't find any good surface forecasts for areas far enough north to make sense of it! 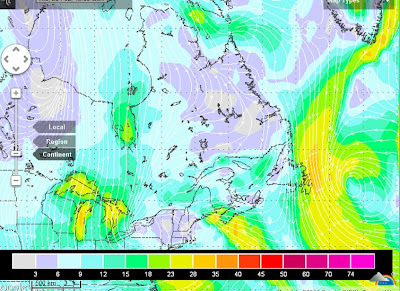 I first noticed that weather.ca shows generally north winds for Burlington for several days in a row, starting tomorrow..
Then I checked out the HPC medium range forecast and saw those isoabrs flowing from Labrador down into southern Ontario.. I'm not exactly going into red alert, but I think it may pay off to focus a bit more attention on those birds in the Feb 28 - Mar 3rd time frame for northern goodies like Gyrfalcon or Eiders ... Or maybe even something like an Ivory Gull (one of my most wanted ON birds)..
Also note than an Ivory Gull was found at Cherry Beach in Toronto on Feb 15th (last map)..
Also note that the IVGU event was the same I experienced in Newfoundland where I saw 116 Ivory Gulls in a 6 days strech.. Doing my talk on Hurricane Sandy for the bird study group (Hamilton) this Monday! Be there or be square. Meetings start at 7:30 PM. Visitors are always welcome. Lots of free parking near the New Central Library. The Bird Study Group meetings are normally held on the third Monday of the month. Bird Study Group meetings normally feature reports of recent sightings, news of birding events, an Identification session focussing on birds which can be difficult to identify in the field, and a main program whose subject can be anything from a talk on bird skins to a slide show on the birds of a distant place. If you are a beginning birder, come out to learn more about birds. If you are an experienced birder, come out to share your knowledge and enthusiasm. So anyways, a prime candidate to team up with and do a mini trip! Mar 6th - leave Hamilton after work in the evening, drive to Sault Ste Marie - arrive around midnight/1am..
Mar 12th - check out early (or the night before) and explore towards home... (along Superior) .. When it gets dark, drive like a mad man back towards home for work the next day. Should be fun methinks! And hopefully good stories and photos will ensue. My slight concern is if the dates are getting a bit late for GGOW's and BOOW's? I seem to remember reading somewhere that they tend to start dissapearing again in late feb/early Mar - but I can't find it now... Anyone? Another idea I've had for a long time is to spend March/early April in southern Ontario and construct a floating blind..
Texas - March 19th-ish to Apr 4th-ish ???????? I'd consider flying down and renting a car to save time, then maybe just stick to the Rio Grande area?? Further north - up hwy 11 towards Temiskaming and north (towards Cochrane?) - already been there, but not for GGOW's..
Thunder Bay - seems like a sweet bet.. With all the Boreal and GGOW's in Minn recently, they'd be hard to miss.. 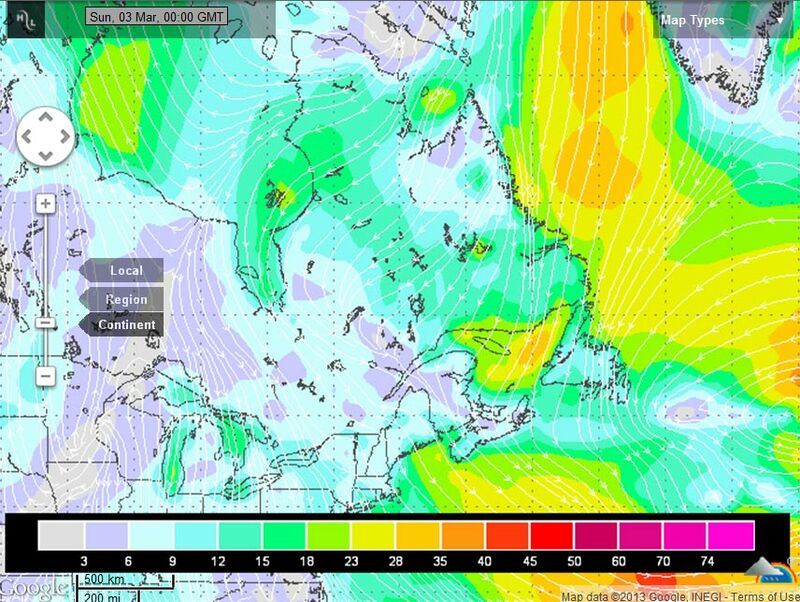 The only problem is Thunder Bay is rather far away in its own right... I'm not sure if I'd be willing to drive or fly there? NAO goes negative, that means we get east winds! The response to my potential Texas trip was rather surprising and welcome! Now I'm going to feel guilty as can be if I can't make the trip work..
Of the days in March, the 15th-17th are my strongest commitments that I really wouldn't like to break..
After Apr 6th is still an option as well, however then my field work season/schedule ramps up - meaning if I were to go anywhere, then I'd be missing out on large numbers of easy fun/bird/wildlife related field work..
Maybe tomorrow I'll post some more of my ideas to kick start the photography... Texas would be my first choice, but it's rather amazing how 24 hours later the odds of it happening look rather bleak.. Note how I'm lacking any actual destinations or specices specific plans... The general goal of my photography trips is to shoot species that we don't have (or a are very hard to photograph) around here.. Presumably I'll have the best luck in the Rio Grande area, so that's probably where I'll focus.. 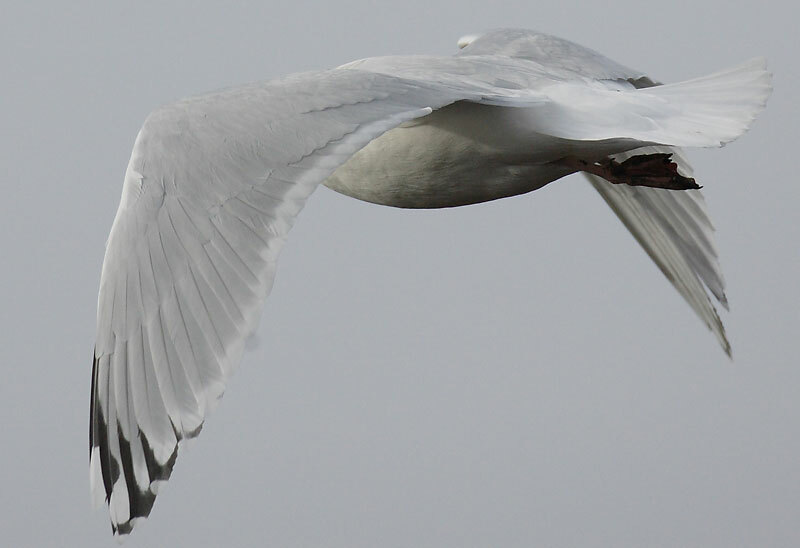 I went through ebird, and picked out some species that I'd really like to photograph (as examples)..
Left photo: Another case of a “Nelson’s Gull” (this time in 3rd ba plumage), where this large Glaucous-gull like bird is showing dark wingtips/tail, vs. the pure-white wingtips of the Glaucous gull shown in the right photo (of the same age). 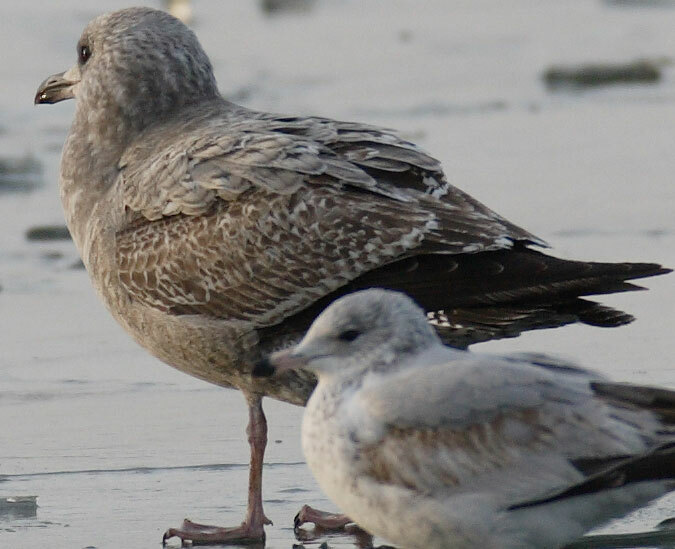 “Nelson’s Gull” on left, appearing similar to a Thayer’s Gull but much larger than that species (noticeable in the field with good looks) compared to a Herring Gull of the same age on the right. 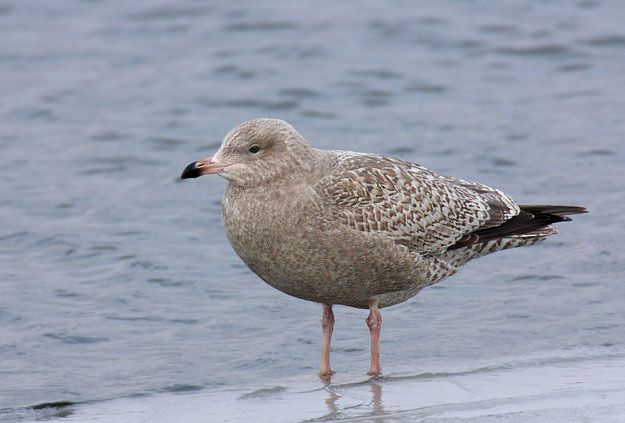 Hybrids often have a pink bill base with a black tip, although not as clean cut as a “typical” Glaucous Gull would be at this age. 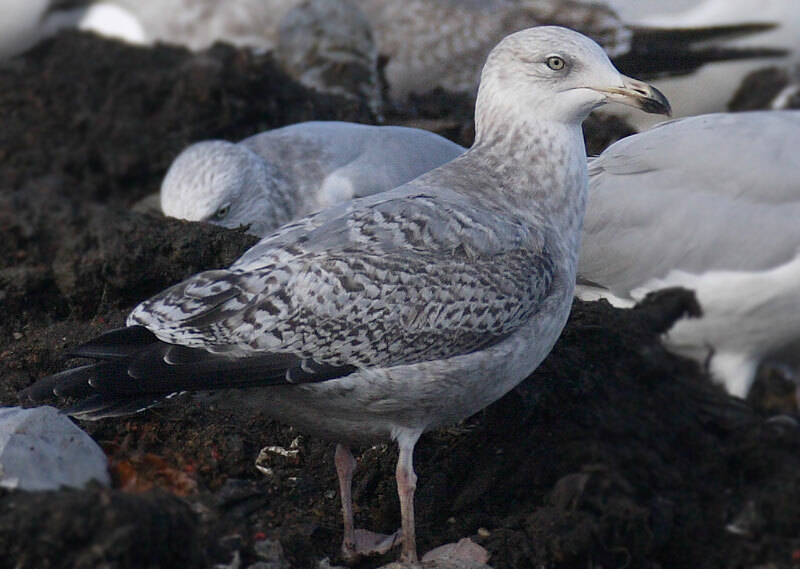 Although uncommon, pure Herring Gulls can show the same bill pattern. Note the “washed out” look to the plumage. Especially in the wingtips, secondaries and tail. This "variety" of Nelson's Gull can be difficult to detect when standing, or at a distance. The identification of this (always presumed) hybrid bird was made with a host of sanding and flight views/field marks. See below for another example of a Herring-like Nelson’s Gull. "Nelson's" Gull on left, Herring Gulls on right. My experience with adult "Nelson's Gulls" is roughly similar to the immature noted above (and most hybrids in general) in that you're looking for a bird with intermediate characteristics. 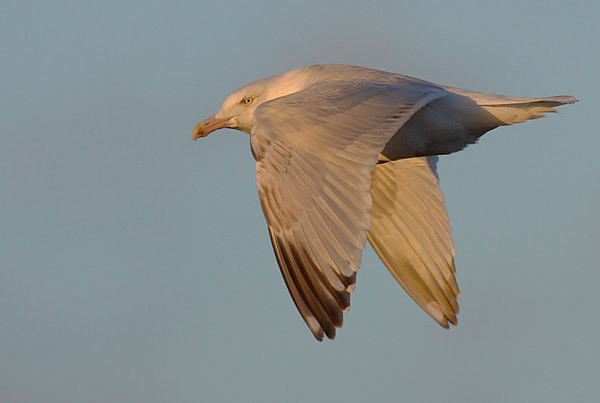 Given that adult Glaucous Gulls have little to no variation (with their pure white wingtips), you as the observer will be trying to separate adult "Nelson's" Gulls from Herring Gulls in the field. 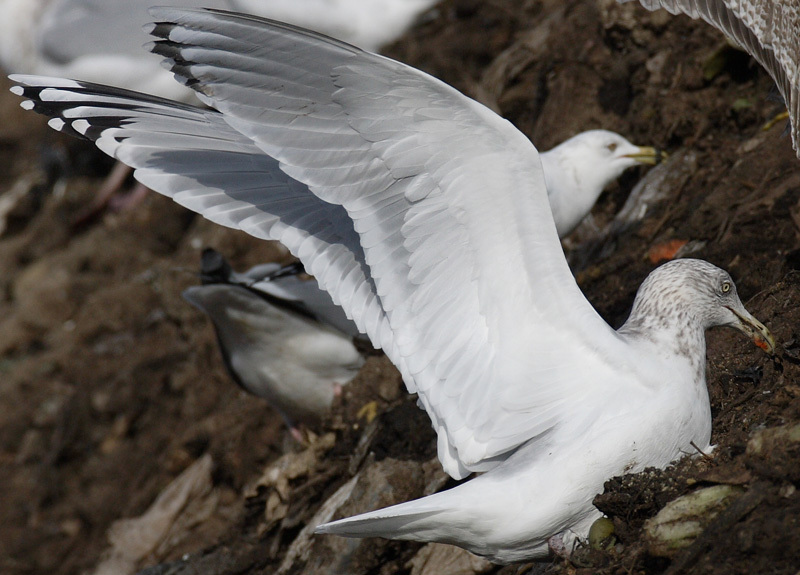 Many adult "Nelson's Gulls" in my experience, are quite large when compared to Herring Gulls (as seen here). 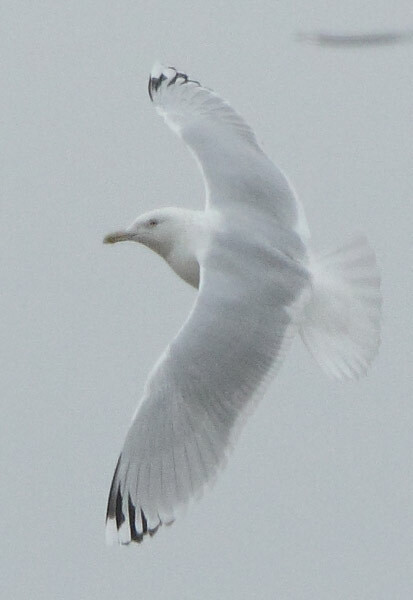 The head structure can recall the big head of a Glaucous Gull and can sometimes have limited streaking (also seen here). Another clue that is sometimes present is a mantle shade paler than nearby Herring Gulls. With all of these features present, I felt the clinching mark was the primary tip pattern of this bird. Note that the white primary tips "bleed" into the black wingtips - unlike the nearby Herrings. 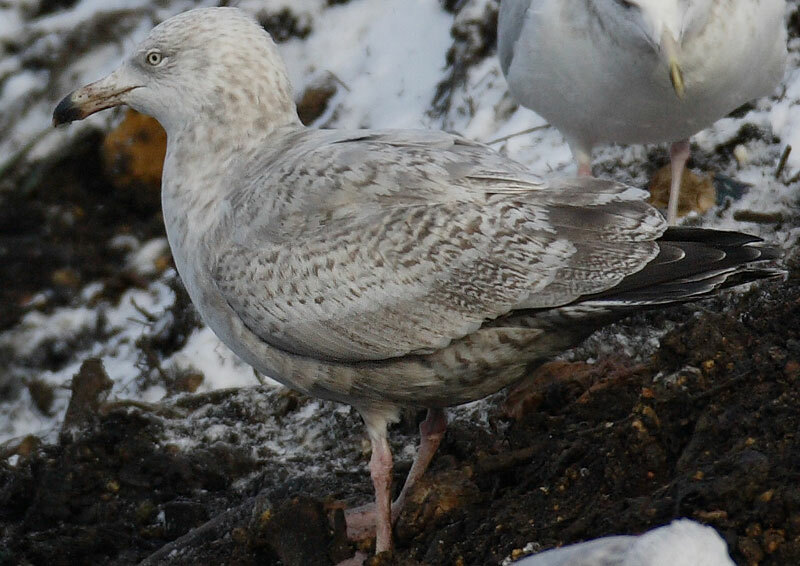 I can only assume this is the "white" of the Glaucous Gull genes battling with the "black" of the Herring genes in this hybrid! Different adult Nelson's Gull on left. "Extreme Variation" of Herring Gull shown on right. Note in both of these Nelson's Gulls above how the white in the very wingtip "bleeds" into the black markings, washing it out. 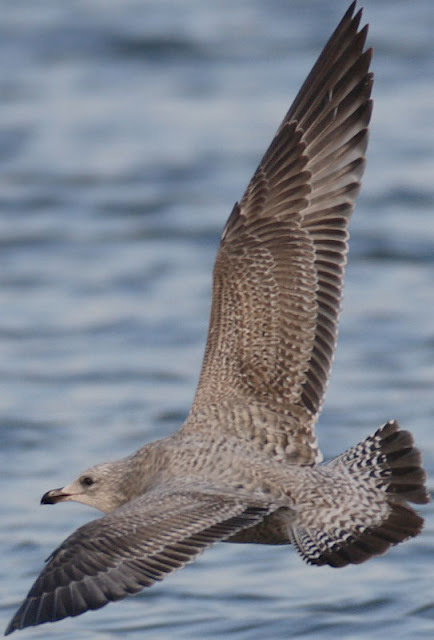 Many Herring Gulls have extensive black wingtips, however there are some extreme variations that sometimes show very little black in the wings as well. I photographed a bird like this (shown above) years ago in Hamilton - however note that the black borders are still sharply defined - unlike the "bleeding" look of the Nelson's. With hybrid gulls - it is important to note that you're looking for general characteristics and nothing is a "set in stone" field mark. I'm sure there are adult Nelson's Gulls that do not have the "bleeding" look in the primaries etc, - however these are just field marks that I have found useful in trying to "figure these birds out" when in the field. It is also not certain that all of these hybirds ARE ACTUALLY Nelson's Gulls. How do we know for sure that some of the above birds aren't Herring X Glaucous-winged Gull hybrids? Well, we don't know 100% - but all signs point towards Nelson's, so I'm pretty comfortable with it. For ongoing learning, here's just a few more different individuals; with brief comments on their unique genetic blend of Glaucous and Herring Genes. A 2nd basic "Nelson's' Gull. 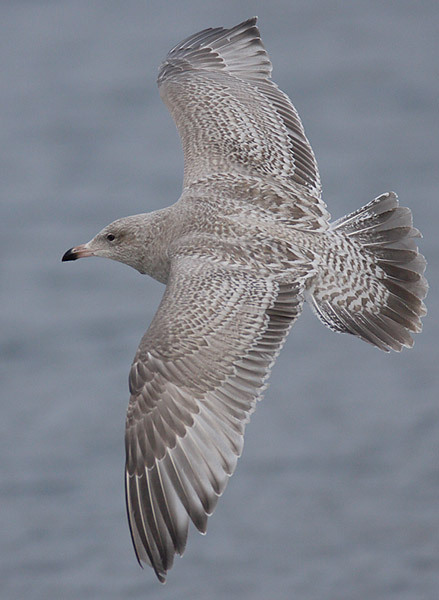 Looks very much like a Glaucous on the head and upper body - but rather dark wingtips! A 3rd basic Nelson's Gull. Again, looks like a Glaucous on the head/eye - however this bird also shows an exceptional amount of dark markings on the primaries. At this age, the bird doesn't have that "bleeding" look - but the dark is much paler than the black expected on Herring Gulls of this age. Similar species or hybirds: Thankfully there aren't many rarities one can confuse Nelson's Gull with in the field... 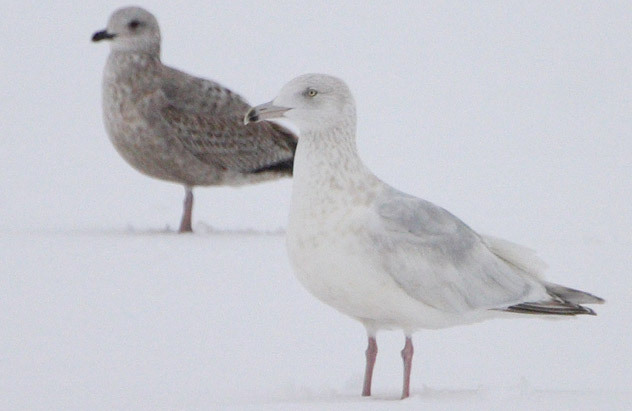 The species that would cause confusion are Thayers's and Kumlien's Iceland Gulls - which can look very similar to Type 1 (Kumlien's) or type 2 (Thayer's) Nelsons Gulls in the field. Best field marks to separate them would be size and structure, as both Kumlien's and Thayers would be much smaller overall. Abundance - this is one of the more commonly encountered hybrids in Ontario, however I do not believe that I have ever seen more than 2 in a day. It is greatly outnumbered by pure Glaucous Gulls in the province. Even with my extensive gull watching, 1 to 3 personal sightings per year would probably be the norm (upwards to 5 or 6 at max). When do you see this hybrid?? It seems to be the belief of many birders that you find this hybrid combination when you're also seeing Glaucous Gulls around. This is 100% correct in my field experience in Ontario! If there is any place where you get concentrations of 10-30+ Glaucous Gulls, you can expect a "Nelson's" to appear eventually. With this said, I have also noticed that Nelson's can often occur somewhat earlier in the fall than the average Glaucous, and also staying later in the spring than most Glaucous Gulls would. 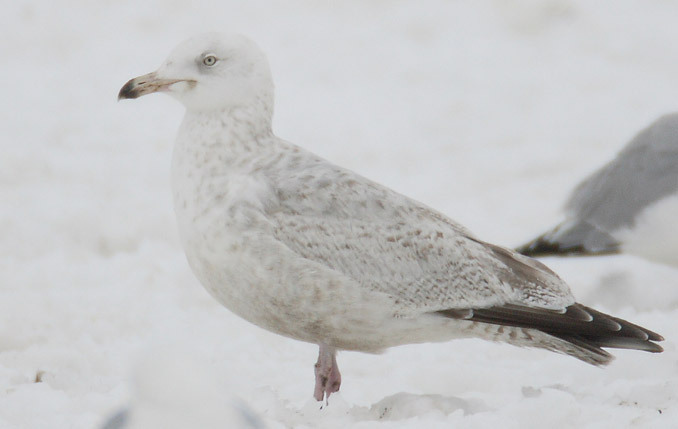 (eg,/ I have seen Nelson's on the Niagara River in November prior to seeing any individual Glaucous Gull. However in mid winter I can easily see 50+ Glaucous without any Nelson's recorded). 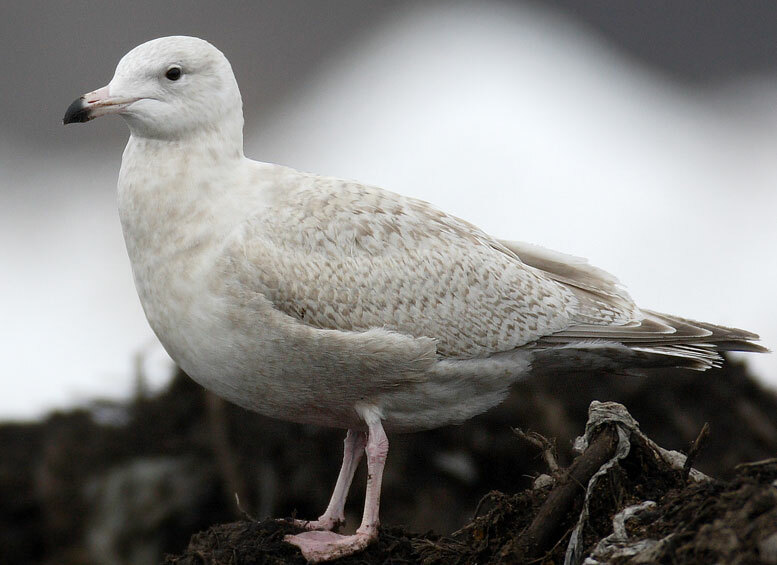 Although the extreme early and late dates for Glaucous Gulls are similar, Nelson's occur in dramatically lower numbers overall, making this noteworthy in my opinion. I can only assume this slightly extended "relative" window of occurrence is due to the influence of the Herring Gull genes! On route to work this morning I had a flock of roughly 40 Bohemian Waxwings fly over my car at Freelton Rd. and Hwy 6. They were pretty low, and I can only assume they were planning on stopping somewhere in the town. Just a heads up that they may soon be at traditional areas around here if they continue "moving in". As a side note, spring migration appears to be underway with the expected Horned Larks - along with a noticeable movement of Herring and Ring-billed Gulls in the past two days along the lakeshore in Stoney Creek. A bright male American Robin (that was rather vocal) in front of my Condo in Stoney Creek was also rather suspicious as a potential migrant. For sure spring appears to be in the air... Just think - we're only a few weeks away from the undeniable start of epic bird migration with Blackbirds, Robins, Killdeer and the start of the spring hawk migration! Sure is exciting, isn't it? --- Category 3-5 Hurricanes are considered "Major's" and therefore Sandy can now use the name "Major Hurricane Sandy" for all time - even if she was only a "major" for a few hours. --- Sandy’s impacts in the United States were widespread. At least 650,000 houses were either damaged or destroyed as a result of the cyclone, with the vast majority of the damage caused by storm surge and/or waves. --- Preliminary estimates compiled from a variety of sources suggest that Sandy was responsible for at least 50 billion dollars in damage in the United States. This figure is highly uncertain and it will probably take several more months before a more accurate total is obtained. Sandy is expected to rank as the second-costliest cyclone on record, after Hurricane Katrina of 2005, and will probably be the sixth-costliest cyclone when adjusting for inflation, population and wealth normalization factors11. It is notable, however, that these preliminary estimates likely include damage from the non-tropical portion of Sandy’s lifecycle, and this complicates the comparison of Sandy to previous tropical cyclones. I forget how I stumbled upon this, but over TWO years ago I wrote a blog post about my predictions on when I could hit 400 species in Ontario. At the end of 2010 my Ontario list was sitting at 352 species (says the above post)… And I had picked 48 species that I expected to see in my attempts to hit 400 in Ontario! I broke the 48 down into two categories. Category 1 was birds I “expected” or “knew” I would see prior to hitting 400 in the province (30 total)..
Of those species, I had the following as “for sure – code 1” birds: Fish Crow, Western Tanager, Common Eider, Black-throated Gray Warbler and Mountain Bluebird. 5 of 11 ain’t bad! Right? A further two species were on my “code 2 guesses” – Neotropic Cormorant and Magnificent Frigatebird. So you can pretty much say I’ve guessed 7 of my 11 last Ontario birds with some sort of accuracy..
You’ll note just how many I could probably add if I spent some time twitching (G. Partridge, N. Bobwhite, WW Dove and SB Gull would have already been get-able in 2013 if I had tried). I’m starting to worry about my Clark’s prediction too.. Mind you I should really delete two of these, given that getting all of them would get me to 402 species… I’d like to delete Clark’s Grebe, but I feel like that’s cheating. So I’ll remove Prairie Falcon and Least Tern for future reference. 7 of those 16 species would not have been on my hindsight prediction list – marked with a *(I’m guessing) or 44%... As mentioned above, I’ve sorta-predicted 7 of 11 in the last two years, which is 5 of 11 - or 45% - unpredictable. Which leads me to believe that on the 35 species I need to hit 400, 15 of them will not be on my list..
I’ve added unpredictable species at an average of 2.75 birds per year, over the past four years. If I can keep that pace up, I should hit 400 in 5.5 years (or when I’m 31). Come check it out! I hope to talk a fair bit about the weather, instead of just a straight bird talk, so hopefully you'll find it interesting and learn something?? Maybe?? Jan 12b - went for a rollerblade (it was 16+ degrees this day).. Added BC Chickadee and DE Junco to the patch list. Also got a Ring-necked Duck! Which was odd and alone just offshore on the open lake. Jan 14 - a flock of 20+ Redhead along shore are undoubtedly record early fall migrants for Hamilton (after they "migrated north" two days earlier. Jan 19 - shimmer on the lake again. Got one of the adult Peregrines and also a sweet adult Kumlien's Iceland Gull along the shore. 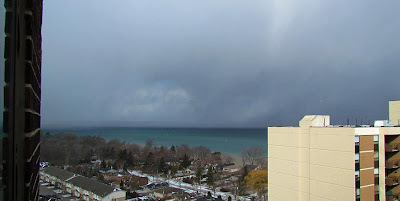 Jan 21 - a Mute Swan swam past the condo again... The third(?) time one has done this I think..
Feb 2 - NEW condo bird - a light morph Juvenile Rough-legged Hawk! Right past the window. Hawks seem to enjoy riding the air currents between the two buildings, so now I'm very excited for spring hawk migration to begin and to see if the migrants do the same. They're often really close. Feb 3 - Why are Surf scoters the most common species of scoter now? Where did the White-wings go? Heck, I may see more Black Scoters (great numbers for winter) than WW's these days! There was also a big flight of Common Mergansers today - first in a while.. Frozen out of somewhere and moving south... Overall a good day with a/nother Common Loon on the water and singles of Kumlien's Iceland Gull (juv) and a Glaucous Gull (adult). I guess that'll happen when its a Sunday and I can watch for more than 30 mins! Feb 5 - a first winter Kumlein's Iceland Gull early. Feb 6 - NEW patch bird. On my way to work, I noticed a swan in the creek bed at Confederation Park. Turns out it was a Trumpeter! Sa-weet! Looking forward to the next few days - forecast E and N winds! Which were awesome back in December. Photoshoot: Transit of Venus in front of the Sun !!!!!! Back in early June, I made sure I spent some time photographing Venus passing in front of the sun... Why? Because it will be the only time in my life I will have had the chance to do so! The Sun + Venus + Lake Superior! To make the best of the situation, I combined several frames together to show the sequence of the sun setting, combined with Venus for a little extra flare... Was pretty happy with this one (well, all of them really). Overall I was very happy with the result!